Based on James M. Cain’s novel the story centers on an insurance man who stumbles into a situation he can’t resist which leads to events he can no longer control. Of course, a woman is involved and she convinces him to write a policy on her husband that pays double for death via train accident (this all takes place in 1937, so that may not be as far-fetched as it sounds today). We find the woman is using him, two-timing him and her stepdaughter steps into the mess while his boss begins to smell a rat as well. So, the best laid plans begin to fall apart. It all makes for a good read in the original novel and- though altered to fit the Hollywood model- the movie turned out very well too. a mixture and that just didn’t work. Director Haney, though hampered with the script, handles the direction well- playing it with a keen eye for noir mystique. 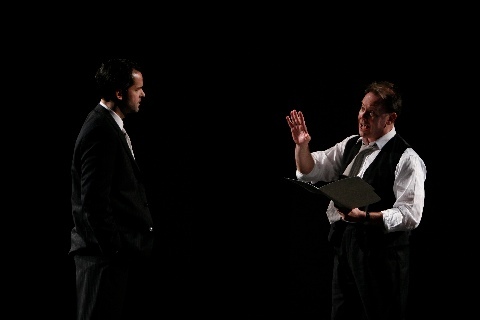 He is particularly adept at almost choreographing his actors around those multiple set changes. The actors give it their all. David Christopher Wells plays it straight with a bit of a mumble and a fast delivery (sometimes too fast as we miss a line or two- especially when he has his back to us). 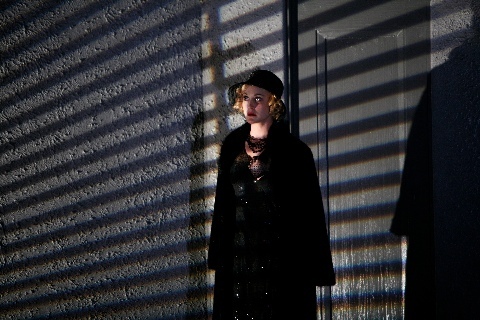 But his Walter Huff captures the essence of those film noir greats. As the femme fatale, Phyllis Nirlinger, Gardner Reed could have smoldered a bit more as she came off more bossy and desperate. Joy Farmer-Clary as the devious daughter, Lola, had no trouble with the smolder- she played it to the hilt. And Michael Sean McGuinness is blustery as Walter’s boss who finally gets to the bottom of the “something doesn’t smell right” case of the husband who winds up dead on the railroad tracks. As that husband, Kevin Cutts does a fine job as does Carrie Vaughan as an associate and Eddie Boroevich in multiple roles including the headstrong boyfriend of Lola. There was only one glaring error in the wonderful costume design of David Kay Mickelsen- that being the flats worn by Phyllis. Gardner Reed may have had a foot problem, but otherwise, no respectable film noir vamp wears anything but heels- and mules with heels when in a dressing gown. Doing some background work on the play, it looks like it started out as two acts and has now been trimmed to a more workable long one-act. There still needs to be some trimming done, however to make it more like a true noir or go the other way as they did with the musical, “City Of Angels” which played it for laughs. It’s hard not to recommend the play, however, for the spectacular set and execution of the scene changes and the whole atmosphere it creates as well as fine work by the cast. 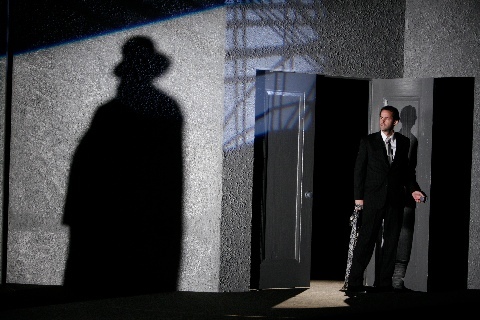 “Double Indemnity” plays at the Rep Mainstage through April 7th. 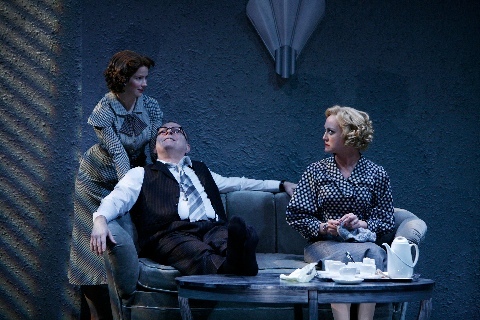 Call them at 314-968-4925 or contact the Rep at http://www.repstl.org for tickets or more information. This entry was posted on March 18, 2013 at 9:43 pm03 and is filed under Uncategorized. You can follow any responses to this entry through the RSS 2.0 feed. You can leave a response, or trackback from your own site.